The ultimate in luxury, featuring detailed stitching to enhance any managerial setting. Styled back with lumbar support. 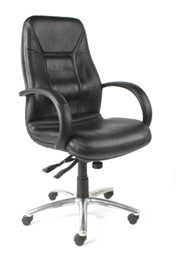 Comes with a 2-lever infinite lockable tilt mechanism fitted on swivel chairs. Accompanying Guest chair is available. Chrome base available for an additional charge.